In the 1960s and early 70s, the Italians cornered the European market in lithe, stripped-back 50cc motorcycles. The designs were invariably minimal, and forty years later, most are still pleasing to the eye. 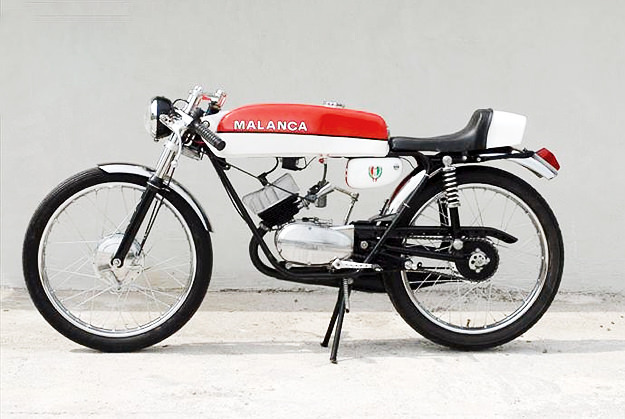 Malanca was one of those Italian manufacturers, producing mopeds and small motorcycles from 1956 to 1986. In the early 70s the company contested the 50 and 125 cc Roadracing World Championships, but was unable to break the dominance of more established track machines such as Kreidler and Derbi. The beautiful racer shown above is owned by a gentleman called Fulvio Iannucci, and is one of many featured on the Piccoli Bastardi (“Little Bastards”) website.